This year, we went back to our normal variety of tree: the Fraser Fir. And we sized it a bit more appropriate for the space. Here's last year's post showing the tree we brought home that was a Douglas Fir. 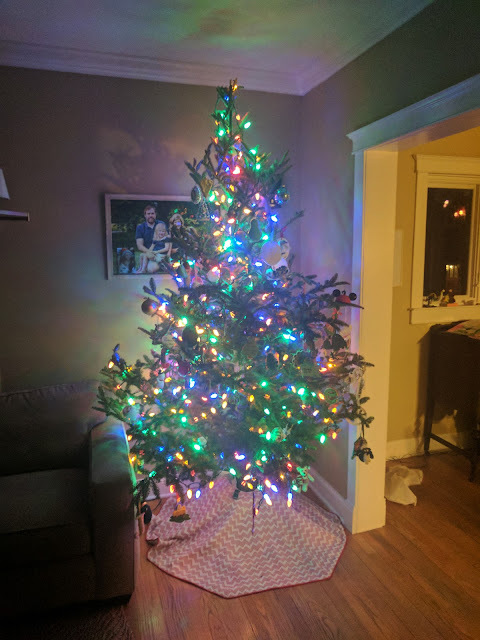 And, once again, we put up our tree, not in our house, but in the house of Equation Boy/Man and my sister Vic, who are graciously putting us up for another holiday season. If you look at last year's post and scroll down you'll see a photo of the Babe putting our angel on top of the tree. In the background, you can also see the trim casing that sits above the opening between the family room and dining room. When you look there, you can clearly see that the angel is sitting *below* that casing - meaning the tree was short. Look at the photo above. The angel - who is MIA - would be sitting well above that same casing. Much better sized. The angel? I *think* I know where she is, but will have to wait until next weekend to know if we found her or not.